Despite last-minute fireworks from a Louisiana Republican, a House committee this morning advanced three major bills, including one that permanently reauthorizes a popular land and water conservation program before it expires on Sept. 30. Natural Resources Chairman Rob Bishop (R-Utah) and the panel’s top Democrat, Rep. Raúl Grijalva of Arizona, hammered out a bipartisan agreement that extends the Land and Water Conservation Fund, a major win for many of the program’s supporters who are tired of 11th-hour scrambles over the years to temporarily authorize LWCF. The voice vote on the deal came as a surprise during a markup that initially was only supposed to consider one bill: the “Restore Our Parks and Public Lands Act,” H.R. 6510. But a decision by House leadership to cancel tomorrow’s session, as well as pressure from Louisiana Republican Rep. Garret Graves to take up his bill boosting the share of offshore oil and gas drilling revenues for Gulf Coast states, forced a doubleheader session on the three bills, as Bishop put it. The committee also advanced Graves’ bill — H.R. 6771, which would increase the revenue-sharing for Gulf states from the current level of 37.5 percent to 50 percent — and the parks bill by voice vote. The LWCF bill would allocate 40 percent of money to the fund’s state-side program, 40 percent to the federal government and 20 percent for other necessary activities that could include deferred maintenance needs, for example. Under the legislation, Washington, D.C., and the U.S. territories would be treated as individual states with equal shares for the purposes of LWCF. Another provision would give a 3 percent set-aside for recreation access, requiring the Interior secretary to put together a list of priority projects. Bishop stuck to his agreement with Grijalva, rejecting several ultimately unsuccessful amendments from other Republicans, including one from Rep. Louie Gohmert of Texas, seeking to decrease the annual authorized $900 million LWCF amount by half. Another from Rep. Paul Gosar (R-Ariz.) would have required the Interior secretary to sell an equal number of acres for land acquired by the federal government under LWCF. LWCF still has a way to go in the face of an abbreviated congressional calendar: The full House needs to take up the measure, and the matter remains in limbo in the Senate. Members there continue to struggle to find a vehicle for reauthorization. Sen. Richard Burr (R-N.C.), the program’s longtime champion who has been pushing in recent weeks to permanently reauthorize it, said he’s “been closely following” the House bill. Burr has not yet taken a position on the House bill, said his spokeswoman Caitlin Carroll. Outside groups were pleased with today’s outcome. “We’re thrilled that Chairman Bishop and ranking member Grijalva are working together on a compromise that advances the Land and Water Conservation Fund in a meaningful way. We’re now one step closer to permanently reauthorizing LWCF,” said Julia Peebles, Backcountry Hunters & Anglers’ government relations manager. However, Peebles acknowledged that the fight wasn’t over. “BHA and our partners will redouble our efforts in support of LWCF to ensure that this bill crosses the finish line — and we also will continue our work to secure dedicated funding for America’s most popular and successful conservation and access program,” she said. The parks bill would create a five-year, $6.5 billion fund for four Interior agencies to address long-standing maintenance and construction backlogs at the nation’s parks, wildlife refuges and Bureau of Indian Education schools. “I recognize this won’t stand alone, but ultimately there will be other pieces that have to go forward with it,” said Bishop, specifically mentioning revenue-sharing with states and the authorization of the LWCF as “elements” that ultimately will have to be dealt with in some way. The money for the proposed “National Park Service and Public Lands Legacy Restoration Fund” would be made up of 50 percent of all otherwise unallocated revenue from energy production on federal lands and waters. Interior’s largest agencies — the Bureau of Land Management, National Park Service, and Fish and Wildlife Service, along with the Bureau of Indian Education — would benefit from the fund. The legislation, similar to a bipartisan bill introduced in June in the Senate, is a combination of existing proposals. But today’s markup devolved into a debate over where precious oil and gas drilling revenues go and which lands and waters benefit from those conservation dollars. Graves and Rep. Mike Johnson (R-La.) unsuccessfully introduced several amendments — more than 20 — to H.R. 6510. All the provisions essentially tried to protect the Gulf Coast states from losing out. Lawmakers from those states, which produce the lion’s share of offshore oil and gas drilling revenues, are concerned the parks bill would take money meant for them. The Gulf of Mexico Energy Security Act, passed after Hurricane Katrina, allowed Alabama, Louisiana, Mississippi and Texas to share 37.5 percent of oil and gas revenues produced in federal waters off their coasts to assist them with coastal restoration and hurricane protection. Graves used the markup to vociferously fight for his state’s share of oil and gas drilling money, which Louisiana uses for coastal restoration and other conservation projects. While the panel rejected his amendments to the parks bill, no one voiced objection to his GOMESA reform legislation, just introduced yesterday. Roig said Graves’ bill would also ensure new revenues would go to coastal restoration projects that help communities better weather hurricanes and other disasters. The proposed 50 percent in sharing would be for leases issues after December 2006. California Democratic Rep. Jared Huffman said he wanted to focus on areas of agreement to restore important wetlands in Louisiana and elsewhere. “We’ve got a lot of grievances we can bring to these conversations,” Huffman said to Graves, responding to the Louisianan’s remarks over how other states benefit greatly from his state’s energy development. “I want to see the right thing done, but without punishing other states,” Huffman said. Grand Teton National Park Superintendent David Vela has been nominated to serve as the next director of the National Park Service. Ending two months of speculation on Friday, President Donald Trump named Vela as his pick to head the agency, which has not had a permanent director since Jonathan Jarvis retired in January 2017. Interior Secretary Ryan Zinke praised the move in an official release. Three new cottages were opened July 16 at Chief Logan State Park in West Virginia. Construction dollars came from gas and oil bonus funds directed to State Parks. More detail on cottages here. Additional projects are scheduled to begin as funds become available. Also, on July 18, the RFP was went out to release $55M in bonds for repairs and improvements to West Virginia State Parks. Most of the funds will be used to address infrastructure repairs, lodge and cabin upgrades and other deferred maintenance needs. CHARLESTON, W.Va. — The top man with the West Virginia State Parks told lawmakers Tuesday the Mountain State is a treasure for adventure seekers and the parks are trying to do more to accommodate those looking for adventure activities. Sam England detailed a list of the top ten outdoor pursuits ranked by the amount of money spent to pursue them nationally during an appearance Tuesday before a legislative interim committee. The top listing was trail sports, which includes hiking, backpacking, rock climbing, and horseback riding. The category also included rappelling and bouldering as well as trail running. All 50 governors have now proclaimed June Great Outdoors Month! Visit www.greatoutdoorsmonth.org/proclamations to see photos and download PDFs of every state’s celebration of America’s great outdoors. Interior Secretary Ryan Zinke is joining the recognition of outdoor recreation on America’s public lands, releasing a new video celebrating recreation’s return and emphasizing the need for modernization of infrastructure. Watch, share and comment on the video via YouTube, Facebookand twitter. Vermont Gov. Phil Scott declared June Great Outdoors Month last week at Elmore State Park. Governor Phil Scott came back to his sometime childhood home on the shores of Lake Elmore last Thursday to encourage more people to get outside and take advantage of what is perhaps Vermont’s most valuable resource: itself. Scott said Vermont has 850,000 acres of public land available for all manner of outdoor recreation, and 8,000 miles of trails. “That’s equal to walking to California and back with enough left over to hike the entire Appalachian Trail,” he said. Thursday’s press conference served a couple of purposes — actually, three, as reporters from several Vermont media outlets pressed the governor on a potential government shutdown. The question is how to get more people outside, and Scott was joined by Vermont State Parks director Craig Whipple and Julie Moore, secretary of the Vermont Agency of Natural Resources. Whipple quipped that sometimes it takes a little “gimmick” to encourage people to get outdoors. Some of those include making parks passes available at libraries all over the state — you check them out the same way you would a book or a DVD — or offering doctors special prescription pads that they can fill out and give to patients, giving them a free day pass. 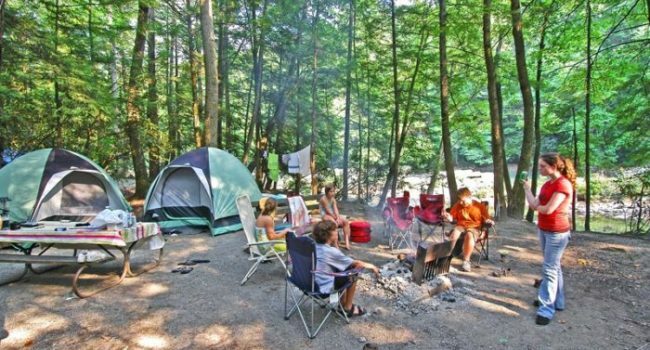 Noting that one of the biggest barriers to camping is buying all the gear, the parks department is also launching a “first time happy camper” program that supplies all the necessary gear and a day pass to one of five parks in the pilot program: Bomoseen, Button Bay, Grand Isle, Stillwater and Woodford. Moore used the governor’s press conference to talk about the new Venture Vermont Outdoor Challenge, a scavenger hunt of sorts where participants score points for all manner of outdoor activity. Most activities score 5 or 10 points. Reach 250 points and you get a day pass good for any state park for the rest of 2018 and all of 2019. “Literally, we have a little something for everybody, whether it’s camping, swimming, hiking, fishing, boating or picnicking, all of these opportunities are available across Vermont’s state parks,” Moore said. This being the governor’s weekly press conference, most journalists in attendance were there to press Scott on one issue: does the administration have a contingency plan if he and lawmakers cannot come to an agreement on a statewide budget and tax plan by the end of this month? The next fiscal year begins July 1, and many government agencies won’t be able to operate without a budget in place. That includes the state parks. Scott refused to be pinned down, saying he is confident the two sides will reach an agreement, but stopping short of saying he would sign a budget or announce contingency plans. The News & Citizen had a question more related to the venue and the previous outdoors initiatives: how is the funding for the cleaning of rivers and lakes, including ones in the very state parks being touted? Lake Elmore, for one, is not in danger of becoming unusable, said Scott. Moore said the state has allocated 75 percent more money for clean water initiatives than the previous two fiscal years. She added state parks employees are also going to assess the health of the waterways in their parks. More information on the Venture Vermont Outdoor Challenge: vtstateparks.com.